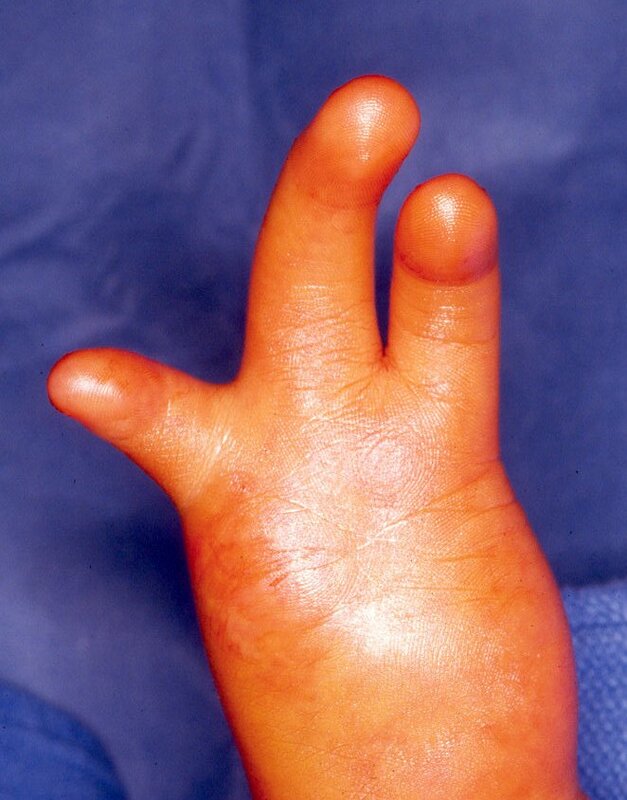 This child's hypoplastic hand had two actively functioning digits and a third, flail ulnar digit. The two working fingers were separated at the level of the metacarpal bases and repositioned to face each other to allow a simple pinch function, using single step rotation angulation osteotomies and an inguinal flap to augment dorsal soft tissue cover. 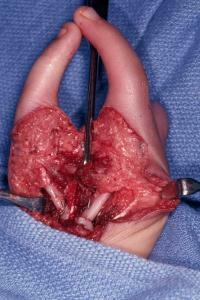 Palmar view: the working central and radial fingers lie adjacent in the same plane; pinch is impossible. Complex repositioning can be obtained by rotating an oblique osteotomy to separate and oppose the digits. The geometry is complex and not intuitive. Final planning is facilitated by trial and error on a model. 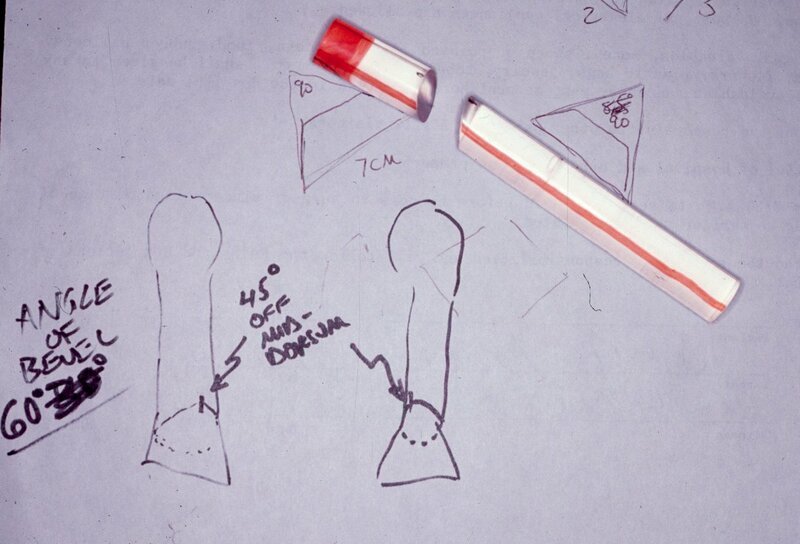 In this case, transparent glue sticks available for hot glue guns (available in any craft store) were used to plan and test the optimum angle of cut and effect of rotation for each osteotomy. Initial dorsal exposure and planning. 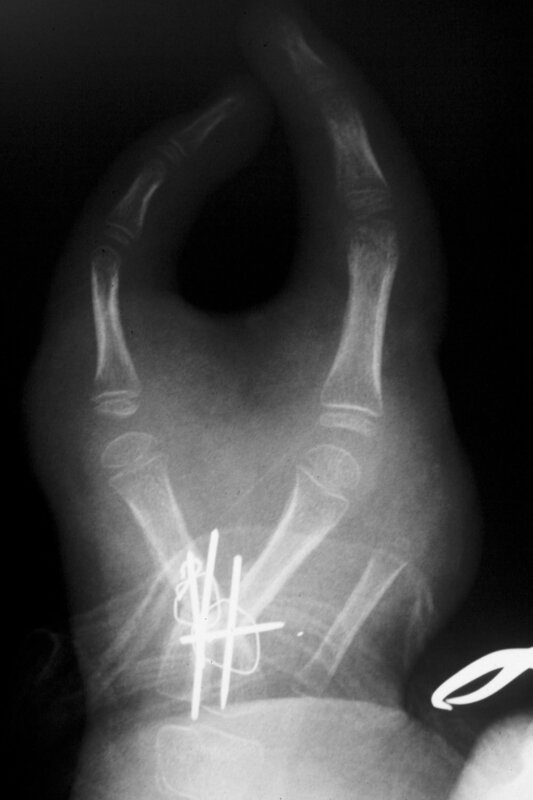 This technique allows both angulation and rotation to be changed in a single step without either bone graft or the need to discard bone. Here, the metacarpals have been simultaneously rotated and angled to separate the fingertips and in the same move position them to face each other. 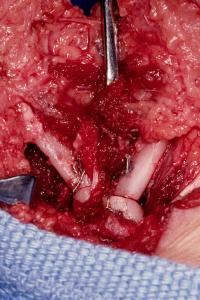 This created a large dorsal soft tissue defect. Closeup of fixation: crossed K wires augmented with interosseous wires. The stretched bifurcation of the common digital artery to the adjacent sides of the digits can be seen at the distal upper end of the image behind the retractor. 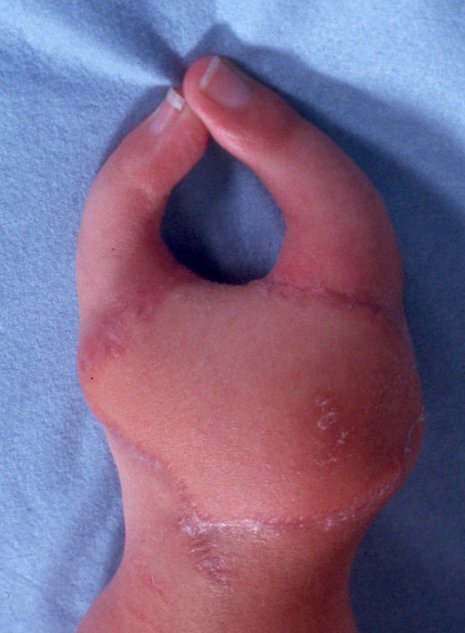 The dorsal defect was covered with a pedicled inguinal flap. Final position. The flail ulnar digit was deleted. Final result, dorsal view: active pinch and release with a widened functional span of separation.